Fleetwood Town have rubbished reports linking their new number one Alex Cairns with a move away from Highbury. Cairns has been Town’s first-choice shot-stopper for most of the past two seasons but has now been confirmed as the official number one, having been given that shirt number for the coming season. Cairns is keen to help Fleetwood battle it out at the top of the League One table and sources at the club are confident he will be between the sticks when the League One season commences against AFC Wimbledon on August 4. The 25-year-old made his first ever EFL start in the 1-0 win over his old club Chesterfield in November 2016. That was the start of the 18-game unbeaten run that propelled Fleetwood into the automatic promotion race, Uwe Rosler’s side eventually finishing fourth. The man he replaced, Chris Neal, retained the number one jersey last term, even though Cairns started the season ahead of him. 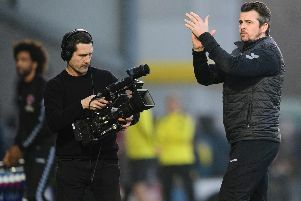 With Neal now at Salford City, new Town boss Joey Barton has given Cairns that coveted number one shirt before announcing the rest of the squad numbers. Cairns’ form over the last two seasons has attracted admirers, with Premier League side West Ham interested last summer, though the keeper is under contract at Highbury until 2021. And Barton expects the shot-stopper, who is yet to concede this pre-season, to show why he has been appointed number one. He said: “For me, I think that Al is a number one goalkeeper. “He has earned that right over the last few seasons. “It is on him now to go and show the faith that the club and everyone has put in him by giving him the jersey. “But I expect him to be exactly the same. Barton does not believe a change of number will alter Cairns.